The last few laps of today’s Geico 500 at Talladega Superspeedway were relatively uneventful, with Dale Earnhardt Jr. holding on to his lead for dear life. That’s right: NASCAR’s most likable dude just brought home the win. 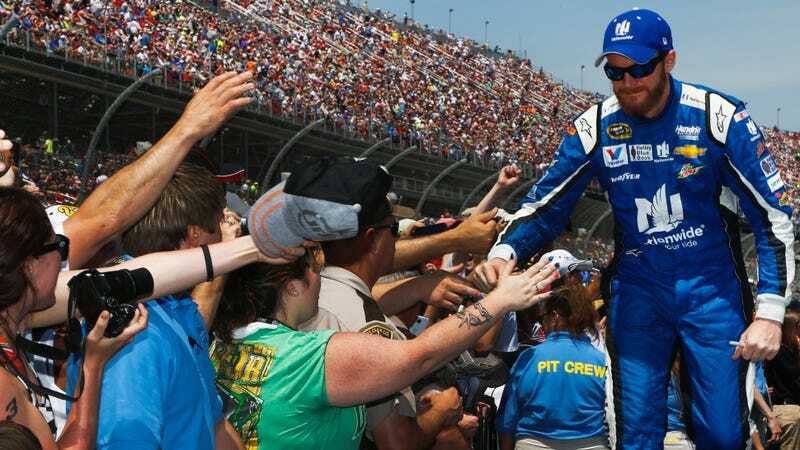 This is Dale Jr.’s sixth win at Talladega and twenty-fourth win in Sprint Cup. Here’s hoping he celebrates by shooting a few more holes in the old car shell he uses for target practice. A Dale Jr. win is truly a win for good ol’ boys (and girls) everywhere. Anyone with a yard full of old racecars is my kind of dude. Dale Jr. started off fourth and stayed near the front for nearly the whole race, even driving more aggressively than usual. Debris got stuck on Dale Jr.’s grill for the last few laps, causing his water temperatures to rise and his gauges to light up with warning lights, but it didn’t matter. He won anyway. There was a spin towards the back of the pack on the last lap, but NASCAR allowed the race to finish under green. Life is good for Dale Jr., especially today.